Eutelsat and RAI transmit EURO2016 matches in Ultra HD. Paris, Rome, July 2016 : The first quarter-final of the Euro2016 marked the kick-off of seven matches that Rai, Italy’s national public broadcaster, and Eutelsat are offering Italian TV homes. The initiative with Eutelsat marks Rai’s most ambitious foray into Ultra HD that represents the next big leap forward in broadcasting. Images of the match were filmed by 14 Ultra HD cameras located by UEFA at the Vélodrome Stadium in Marseilles and sent to the International Broadcasting Centre (IBC) in Paris where they were forwarded to Eutelsat’s Paris-Rambouillet teleport. 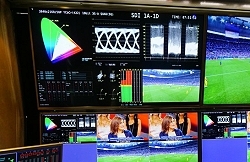 A temporary studio set up by Rai at the teleport added live commentary, after which the special Rai 4k channel was encrypted and uplinked to Eutelsat’s HOTBIRD satellites. Tivùsat homes equipped with an Ultra HD screen and a CAM certified by Tivùsat were able to watch the first quarter-final which was followed on1, 2 and 3 July by the three other quarter finals. Similarly, viewers will be able to watch in Ultra HD the semi-finals on 6 and 7 July and the final match on 10 July. The special broadcasts also involve the support of industry-leading technology partners, including DBW COMMUNICATION and V-Nova that is providing the P.Link 4K, a software-based contribution encoding and decoding system that can contribute the highest signal quality from the IBC.